Some of the disciples were fishing at night and caught nothing ALL NIGHT. Yup! And they caught NOTHING until Jesus showed up. You know the rest of the story (Read John 21). Anyway, because Google is my friend, I 'asked' Google and here is what I found out via the Northeast Fisheries Science Center (NEFSC): Most fish actually rest, and even 'daydream.' Most of them don't have eyelids and even when they are alert for danger they can still be 'sleeping.' You can read more about this HERE. So, in concluding this section, I had another question: Do mermaids ('mami-water") sleep? If you see one, ask her (or it). As for me, I will be the one on the other side of the river calling down fire from heaven and screaming "Blood of Jesus!" Likes: What really brings this song to life is the guitar (I don't know which type. I have not yet progressed to that level yet, but I shall get there), followed by the drums, but the drums take a back seat to the guitar in this song. Frankly, I was listening for the guitar for the most part. I LOVED it because it changed during the song. The song begins with a guitar intro with the drums accentuating the guitar chords. And then the lead vocalist comes in. At some points, the lead vocalist is accompanied by another person's voice. That vocal combination was okay mostly because they left me in no doubt as to who was in charge the whole time. The other voice reminded me of like an "alter ego" (I am not describing this thing well...please bear with me). It is like when you hear two voices in your head and one voice is louder than the other. But this time, the two voices were saying the exact same thing (in my head, they are usually at opposites). Dislikes: In most songs I listen to, as long as they are by Nigerians, I look for what I call the "Naija flavor." That was missing for me in this song.I am not sure this is "bad," depending on how you view Christian rock music (which this song fits neatly into). It came across as a Naija version of an oyinbo Christian rock song. While you might argue that that has more to do with the genre of music they have chosen, I am of the opinion that as long as it is music you are singing/performing, you can still infuse it with that "Naija flavor." 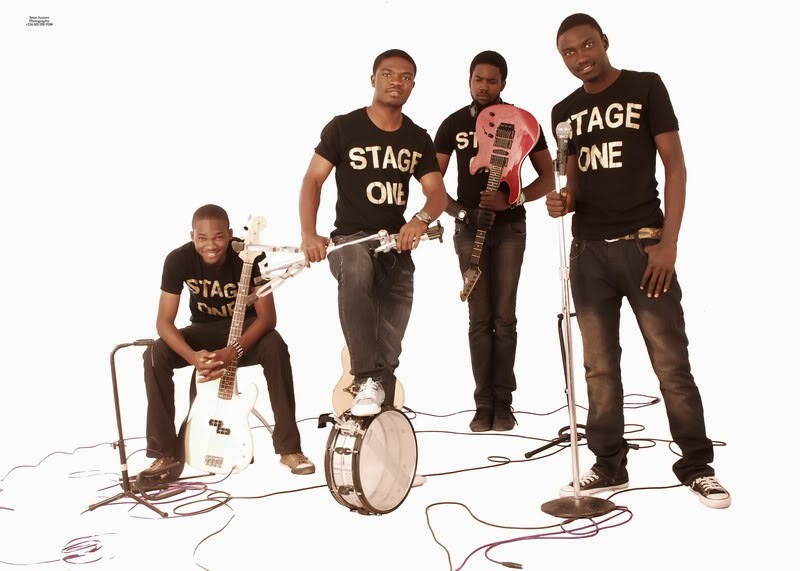 I am guessing though that Stage One were not trying to inject any Naija flavor into this song, but were trying to move as close to the typical Christian rock music model as much as possible (Please correct me if I am wrong. I would love to hear another perspective). In their bid to do this, I hope they realize that what CAN make them stand out is that "Naija flavor." Another thing I did not particularly like about this song was the fact that the main soloist sounded like he was straining in some major parts of the song (e.g. the chorus). This genre of music relies heavily on the strength of the voice of the lead vocalist, and that 'took away' from the song in those parts. He sounded tired. But in all fairness, (y'all know I try to be fair with my criticism) they made up for it with the "screaming" part towards the end. Now, that screaming part can go either way, i.e. you might like it or hate it. I liked it because of the genre of music AND the message. It would not have fit in an R & B song, but for a rock song talking about bringing the dead to life, it made total sense. @ Jemima: Abi o! Me and my mind sef ... May God help us both! How I ever came to that question I still wonder. Stage One will appreciate your feedback o. Thanks in advance. @ Atilola: My mind shey? The things that go on in there ... LOL! According to what I read, apparently they do, but they don't close their eyes like we do because they don't have eyelids (except for sharks). See I have learnt all this by force ... LOL! @ Toin: Happy New Year to you too! Yes o, apparently they do. Maybe they are dreaming of a world where fish rule and humans 'drool' ... Who knows?! @ Naija4Life: You definitely caught me red-handed! LOL! I eat a lot of fish actually. I am glad you found the post funny. I found myself chuckling while putting it together. haha!!! The other day I along with some twitter friends wondered if babies pooped while in the belly! Google is AWESOME! Love the layout too! dope. Your mind sabi wander sha. LOL. I learnt something new today about animals. Thanks to your active mind. Will listen to the song later. My internet is acting up. Please listen to the song when you can and I hope you enjoy it. Thanks for stopping by. I agree with every one. Your mind is soo adventurous. 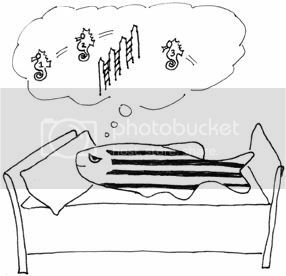 But come to think of it, do fish sleep? LOL! I think they sleep but with their eyes open. Maybe not the way humans view sleep, they just become inactive. About the rock band, well if they are based in Naija, the Naija flavour is really appreciated as you thoroughly explained in your analysis. Well kudos to globalization. This days its hard to tell. Poem ke? Oya, knock yourself out! That should make for an interesting read. Thanks a lot for the feedback on the band o jare. I am sure they appreciate it. I was beginning to wonder why I didn't get any feedback on the "Naija flavor" question. Globalization or not, it is important for your music to stand out, and that's one way to do it. Where can I listen to more of their songs?I agree with you that there is no naija flavor, but is that really necessary? One danger with "naija" flavor is that you could miss it, especially going by language. Not everyone understand pidgin, and then the vernacular is even more limiting. There is one singer that does Igbo gospel rock, Clay is her name and Nenum and Ogadisinma are some of her songs. They're OK too, but may not make so much sense to a non-Igbo speaker.With Stage 1, the message is universal. Myne: I'm not a fan of death metal, but I like rock music in general. I like their own interpretation and perspective, which is why I featured them. They understand this genre quite well and have chosen it carefully. That's what strikes me as notable. The screaming part was iffy to me, but I decided it made sense in the context of the song itself. I think the Naija Flavor is necessary for the simple reason that it will help to distinguish them from being just another Christian rock group. But for the fact that they are Nigerians, I may not have paid attention to the song because the christian music market is saturated with many rock bands. The Naija flavor is something they can capitalize on to distinguish themselves. It does not have to be via language. I think they can do it with the instrumentation/beats, but I can see how that might be challenging since it is rock music they have chosen to focus on. Funny enough, I have heard Clay and am familiar with Ogadisinma. I have not heard Nenum before. I was not sure whether or not she was a gospel artiste though. I see your point about singing in another language, but I don't consider it to be a big deal. Music has a way of connecting with people even when they don't understand the lyrics. I admit though that translations are quite helpful and for that reason, Stage One avoids that complexity by using English exclusively. Okay, let me stop here (Dis comment don dey resemble WAEC answer ... LOL! Thanks for your support (on their behalf).